Mikhail (Mischa) Moiseyevich Botvinnik was born on August 17 (old style: August 4), 1911 in what was then Kuokkala, in the Russian-controlled Grand Duchy of Finland, the predecessor of modern Finland. . It is now the district of Repino (as of 1948) in Saint Petersburg (renamed Leningrad in 1924). The Grand Duchy of Finland existed as part of the Russian Empire until 1917, when Finland declared its independence. Kuokkala was renamed Repino in 1948 after its most famous inhabitant, Ilya Repin (1844-1940), a painter and sculptor. Botvinnik’s parents were Russian Jews. Mikhail Botvinnik had an older brother, Issak, and a younger sister, Maria. His father, Moisei Lvovich Botvinnik (1878-1931), worked in his youth in an underground ant-tsarist press of the Bund (Jewish group) in Minsk. After Moisei lost his teeth because of “poisoning,” he decided to become a dental technician. He moved to St. Petersburg to work as a dental assistant’s apprentice. His mother, Seraphim Samoilovna Rabinovich (1879-1952) was a dentist who belonged to the Russian Social Democratic Workers Party (Mensheviks). At age 22, she was exiled to Siberia for two years as a member of the General Jewish Labor Bund, a Socialist group that was put down by the tsar. Because of their status, the Botvinnik family did not have to live in a restricted Jewish boundary as most Jews in Russia were restricted at the time. The family lived in St. Petersburg and Mikhail grew up on the most fashionable street, Nevsky Prospekt. They lived in a seven-room apartment and had a cook and a maid. In 1920, Mikhail’s father left the family to marry a noblewoman. In the September 1923, at the age of 12, Mikhail (Misha) Botvinnik was taught chess by Leonid Baskin, a school friend of his older brother, Isaak, known as Issy or Isya. Botvinnik’s first chess games were played on a homemade board and set. It was a square piece of plywood with the squares shaded in ink. The chess pieces were carved from palm wood. Botvinnik’s parents were against hem playing chess, fearing that he would become a gambler. Isya later became an engineer for the city of Leningrad and created the first system of traffic lights in Leningrad. Isya had a good income and helped Mikhail with his finances. In October 1923, Botvinnik received as a gift, his first chess book. It was a bound volume of Shakhmatny Listok for 1876-1877, edited by Mikhail Chigorin. In February 1924, Botvinnik played in a simultaneous exhibition given by Emanuel Lasker in Leningrad. Botvinnik had to quit his game after 15 moves because 12-year-olds had to be home by then. In March 1924, Botvinnik played in a school tournament in Leningrad. One of his first published games came from that event. In 1924, Botvinnik won his school’s chess championship. In June 1924, he joined the Petrograd Chess Assembly. The minimum age was 16, so 12-year-old Botvinnik had to lie about his age to become a member. His mother paid for his dues to the Assembly and for his first tournament entry fee. Botvinnik won his first two chess tournaments organized by the Assembly. Later, the Assembly was replaced by a club in the city’s Palace of Labor. There is no evidence that Botvinnik played any correspondence chess. On November 20, 1925, on a rest day during the “First Moscow International” chess tournament, world champion Jose Capablanca gave a 30-board simultaneous exhibition at the Small Hall of the Philharmonic, in Leningrad, attracted by a large honorarium (and a rendezvous with a beautiful girl). It was a 9 hour trip by train from Moscow to Leningrad. 14-year-old Botvinnik was selected as one of his opponents, and won the game as Black after 32 moves. When Capablanca resigned, he swept away the pieces and moved on. The game was printed in the newspaper Izvestia. In 1926, Botvinnik gave his first chess simul at the Park Ekaterinhof in Leningrad. In April 1926, Botvinnik won the semi-final of the Leningrad championship with an 11.5 out of 12 score. In July 1926, Botvinnik played in the Leningrad championship and tied for 2nd place with I. Rabinovich, behind Alexander Ilyin-Genevsky. In August-September 1926, Botvinnik competed in the USSR North-West Region chess championship. In November 1926, Botvinnik, age 15, was selected for Leningrad’s team in a chess match against Stockholm, held in Sweden. Botvinnik scored one win and one draw against future grandmaster Gosta Stoltz. Botvinnik later annotated his games for Shakhmatny Listok magazine. In 1927, he qualified for his first USSR Championship final stage as the youngest player ever at that time. In October 1927, he tied for 5th place in the 5th USSR Championship, and won the title of National Master, exceeding the master norm by 2.5 points.. There was no prize money for any of the participants, as money had been abolished in Soviet championships. The traditional ceremony of “initiation” as a master was to be thrown to the ceiling. In February 1928, Botvinnik took 1st place at a metal workers trade union championship, and won 40 rubles. Botvinnik’s first chess coach was Abram Model (1896-1976). Model was a chess master at the time, but had his master title taken away from him due to lack of results. In 1937, he tied for 3rd place in the USSR Chess Championship. Botvinnik later switched to Viacheslav Ragozin as his coach. In 1928, he was admitted to Leningrad State University’s Mathematics Department. However, Botvinnik wanted to get into the electric/mechanical department of the more prestigious Leningrad Polytechnic Institute. In January 1929, a senior bureaucrat sent a letter to the dean of the Leningrad Polytechnic Institute, stating that Botvinnik was the youngest chess master in the Soviet Union and has a great capacity for the mathematical and physical sciences. Botvinnik was then accepted as a student at the Polytechnic that month. In January 1929, Botvinnik played for Leningrad in the student team chess championship against Moscow. In the summer of 1929, Botvinnik spent 6 weeks at a boot camp for Polytechnic students. At the camp, he tried blindfold chess for the only time in his life. He was able to play 3 games simultaneously blindfolded without any difficulty. He also played blitz chess briefly while travelling on a train to a chess match. In 1929, Botvinnik placed joint third in the semi-final stage of the USSR Championship held in Odessa, and thus failed to reach the final stage. In March 1930, Botvinnik won the Leningrad Masters’ tournament with a 6.5 out of 8 score (6 wins, 1 draw, 1 loss). It was the first master chess tournament (all 9 players were Russian masters. ) Botvinnik won. His prize was a German chess clock. In January 1931, he won the Championship of Leningrad. Also in 1931, Botvinnik joined the Komsomol. In 1931, at the age of 20, Botvinnik won his first Soviet Championship in Moscow, the 7th Soviet Championship (won 12, drew 3, lost 2). He would win the Soviet Championship 6 times (1931, 1933, 1939, 1944, 1945, and 1952). ). Botvinnik shares the record of most USSR chess championship titles with Mikhail Tal, who also won it 6 times. In the late summer of 1931, Botvinnik graduated with a degree in Electrical Engineering, after completing a practical assignment on temporary transmission lines at the Dneiper Hydroelectric Station. He stayed on at the Leningrad Polytechnical Institute to study for a Candidate’s degree. In 1932, Botvinnik won the Leningrad championship. In December 1932, Botvinnik became a postgraduate in the Polytechnic’s Electro-Mechanical Department. In September 1933, he won the 8th Soviet Championship (won 11, drew 6, lost 2), held in Leningrad. Botvinnik celebrated by getting drunk on vodka. In 1934, Botvinnik drew a match with 25-year-old Salo Flohr, held in Moscow and Leningrad. At the time, Flohr was probably the 3rd strongest chess player in the world, behind Alexander Alekhine and Isaac Kashdan. The first part of the match was held in the Hall of Columns of the House of Unions in Moscow. In Leningrad, the match was held at the Leningrad Conservatory. The score was 2 wins, 8 draws, and 2 losses for both players. In May 1934, 22-year-old Mikhail Botvinnik met 19-year-old Gayane (Ganna or Ganochka) Ananova Davidovna, the daughter of a professor of descriptive geometry at Botvinnik’s school, the Leningrad Polytechnic. She was a student at the Vaganova Academy of Russian Ballet in Leningrad and later, a ballerina in the Bolshoi Theatre. In 1934-35, Botvinnik tied for 5th-6th at Hastings. It was Botvinnik’s first chess tournament outside the USSR. In 1935, Botvinnik shared 1st place (9 wins, 8 draws, 2 losses) in Moscow’s second International Tournament with Salo Flohr. Botvinnik accepted a free Emka car and a 67% increase in his postgraduate study grant (from 300 to 500 rubles), both provided by the People’s Commissariat of Heavy Industry. Botvinnik received 5,000 rubles prize money, which he used to buy bedroom furniture. The tournament was organized by Nikolai Krylenko. In April 1935, Botvinnik married Gayane Ananova. In June 1936, Botvinnik finished 2nd , behind Capablanca, in the 3rd international chess tournament held in Moscow. Botvinnik scored 7 wins, 10 draws, and 1 loss. The event was also organized by Krylenko. In August 1936, Botvinnik shared 1st place (6 wins, 8 draws, no losses) with Capablanca in a tournament at Nottingham, England. Each scored 10-4. This was the first tournament victory by a Soviet master outside of the USSR. Nottingham had four world champions, Lasker, Capablanca, Alekhine, and Euwe, and a future world champion, Botvinnik. It also had Reuben Fine, Sammy Reshevsky, Efim Bogolyubov, and Salo Flohr. Botvinnik had just turned 25. Alekhine wrote that Botvinnik was the most likely candidate for the world championship. When Botvinnik returned to the Soviet Union, the Presidium of the Central Executive Committee, then the highest governing body of the USSR, awarded him a Badge of Honor. Botvinnik won the brilliancy prize and used the money to by an Underwood typewriter. He later used that typewriter to type his doctoral dissertation. After the tournament, Botvinnik sent a telegram to Joseph Stalin thanking him for his victory. The telegram was printed in Pravda two days after the event ended, thanking the whole nation, the party and Stalin. It was later learned that the telegram was written in Moscow by Krylenko and that the KGB told Botvinnik to sign it. In April-May 1937, the 10th USSR Championship was held in Tblisi, but Botvinnik refused to play in it as he was defending his thesis at the Polytechnic. The winner was Grigory Levenfish. In June 1937, he received his Candidate’s degree after finishing his dissertation. In October 1937, Botvinnik drew a match with Levenfish (5 wins, 3 draws, 5 losses), held in Moscow and Leningrad. In November 1938, Botvinnik took 3rd place (3 wins, 9 draws, 2 losses), behind Paul Keres and Reuben Fine, at the AVRO tournament in the Netherlands. In 1939 he challenged Alexander Alekhine for the world chess championship, which both agreed, but World War II broke out and the challenge never took place. In 1940, Botvinnik shared 5th place in the USSR championship. He attributed his poor showing to the unaccustomed difficulty of concentrating in a party-like atmosphere filled with noise and tobacco smoke. In 1940, the first Botvinnik School was formed in Leningrad. It continued until the Nazi invasion. In March-April 1941, he won a tournament for the title of “Absolute Champion of the USSR.” Botvinnik had persuaded Vladimir Snegirov, head of the Soviet chess department, to promote this so-called ‘absolute championship’ of the USSR to show that Botvinnik was still the strongest player in the USSR. The event was held in Leningrad and Moscow. Botvinnik won with 9 wins, 9 draws, and 2 losses. There were 6 players. In June 1941, Nazi Germany invaded the Soviet Union. Botvinnik was exempted from military service due to poor eyesight. In August 1941, Botvinnik and his wife evacuated to the city of Molotov (renamed Perm in 1957), 900 miles away in the Urals. Botvinnik obtained a job with the Ural Energy Organization, soon becoming head of the high-tension department. In September 1941, Botvinnik’s brother, Isya, died at the front from incoming German bombs. His aunt and uncle also died in the early days of the war. In April 1942, Botvinnik’s daughter, Olga (Olya), was born in Perm (Molotov). In January 1943, Botvinnik personally appealed to defense minister Vyacheslav Molotov to have him exempted from war work for three days a week so that he could study chess. In 1943, Botvinnik won a chess tournament in Sverdlovsk. In 1943, Botvinnik was transferred to Moscow and won the Moscow Championship in December. In May- June 1944, Botvinnik successfully defended his title as chess champion of the USSR, held in Moscow. It took 6 months before he received any prize money. In 1945, Botvinnik again challenged Alekhine, but Alekhine died before a match could take place. In June 1946, Botvinnik played C. H. O’D. Alexander in the Anglo-Russian radio chess match. Botvinnik won the first game and Alexander won the second game. When the Second World War ended, Botvinnik won the first high-level post-war tournament, at Groningen in August-September 1946, scoring 14.5 points. There were 20 players in the event. This was Botvinnik’s first outright victory in a tournament outside the Soviet Union. Botvinnik was presented with a silver cigarette case, a gift of Queen Wilheimina, even though Botvinnik didn’t smoke (Botvinnik smoked briefly for 2 months durng a study group in 1928, but once the studies were over, he gave it up). . Botvinnik won the tournament despite losing his last-round game (lost to Najdorf). Former world champion Max Euwe, Botvinnik’s only rival who had a chance to pass him at the end, also lost his last-round game (lost to Kotov)! In 1946, Botvinnik considered giving up chess. In 1947, Botvinnik won the Mikhail Chigorin Memorial tournament. Botvinnik was paid two days a week for playing chess. In 1947, Botvinnik did not play in the 15th USSR chess championship in protest over the cancellation of the world chess championship. In 1947, ten-year-old Boris Spassky defeated Botvinnik in a simultaneous exhibition. In March-May 1948, Botvinnik won the World Championship match/tournament, held at The Hague and Moscow and organized by FIDE. Botvinnik was recognized as FIDE world chess champion and the 6th official world chess champion. Botvinnik scored 14 points (10 wins, 8 draws, 2 losses), followed by Smyslov (11), Keres and Reshevsky (10.5), and Euwe (4). Ten rounds were played at The Hague and 15 rounds was played at Moscow. Botvinnik’s prize money was equivalent to $5,000. In 1949, Botvinnik published a major work on motors and generators called Regulation of Excitation and Static Stability of the Synchronic Machine. In 1950, Botvinnik was one of the original FIDE grandmasters. In the 1950s,Botvinnik used Yuri Averbakh as his secret chess trainer. In March-April 1951, Botvinnik drew with 27-year-old David Bronstein after 24 games in Moscow, keeping the world title. Both players won 5 games each and 14 games were drawn. In 1951, Botvinnik earned a PhD in Science and Technology. His dissertation was entitled Regulation of Oscillating Current in Electrical Equipment. In 1951, Botvinnik took 5th place in the Soviet Championship. In March-April 1952, Botvinnik took 3rd at the Maroczy Memorail at Budapest. In June 1952, Botvinnik’s mother died from a brain hemorrhage. In July 1952, the Soviet chess players on the Chess Olympiad team, to be held in Helsinki, voted for the line-up and placed Botvinnik on second board, behind Paul Keres. Botvinnik protested and refused to play. Yefim Geller was then added to the team. In March-May 1954, Botvinnik drew with Vasily Smyslov (1921-2010) after 24 games in Moscow, again retaining the title. Both players won 7 games each and 10 games were drawn. In 1954, Botvinnik was on board one at the Amsterdam Chess Olympiad and won the gold medal with 8.5 out of 11. He played on 6 gold medal winning Soviet Olympiad teams from 1954 to 1964. In 1956, Botvinnik shared 1st place with Smyslov at Moscow. This was Botvinnik’s only first place finish during his world championship years. In 1956, Botvinnik was awarded the International Judge of Chess Compositions. In 1957, he was awarded the Order of Lenin for his chess successes. In March-April 1957, Botvinnik lost the world chess championship match to Vasily Smyslov in Moscow. After 22 games, Smyslov won the match (12.5 to 9.5) and became the 7th official world chess champion, ending Botvinnik’s nine-year reign as world chess champion. In March-May 1958, Botvinnik beat Smyslov in a return match (12.5 to 10.5) to become world champion again. In March-May 1960, 48-year-old Botvinnik lost the world chess championship match to 23-year-old Mikhail Tal. In 1961, Botvinnik was awarded an honorary PhD in mathematics from the University of Ferrara for his work on computer chess. In March-May 1961, Botvinnik beat Tal in a return match to become world champion again. Botvinnik won 10, lost 5, and drew 6. In 1963, Botvinnik lost his title to Tigran Petrosian in Moscow. Resentful that FIDE had abolished the return match, Botvinnik made no attempt to qualify and play in any further world championship qualifiers or matches. Botvinnik never won a match when defending his title. His overall record in match play was 2 wins, 3 losses, and 2 draws. His world championship record was 36 wins, 39 losses, and 82 draws. In 1963, Botvinnik opened a Botvinnik School of Chess. Future world champions Anatoly Karpov, Garry Kasparov, and Vladimir Kramnik all studied under him. In 1965, Botvinnik was seeded in the 1965 Candidates tournament, but declined to participate. Resentful that FIDE no longer allowed a return match (the ‘anti-Botvinnik’ law), Botvinnik made no attempt to enter the next world championship cycle and said it was too tiring. In 1967, Botvinnik served as consultant to Soviet computer chess developers. He later advised the team that created the chess program Kaissa. In 1969, Botvinnik was training for a possible match with Bobby Fischer. In 1970, Botvinnik played board 8 in the USSR vs. Rest of the World match. He won one and drew three against Milan Matulovic. In 1970, at age 59, Botvinnik gave up tournament chess in order to concentrate on the development of chess computers. He developed a chess-playing algorithm that tried to “think” like a human grandmaster rather than a brute-force strategy now used by fast chess engines. His algorithm was based on Claude Shannon’s selection type B strategy. The chess computer program he worked on was called Pioneer. Botvinnik became a professor specializing in electronics and tried to design an electronic chess player capable of matching the skill of a grandmaster. He tried to perfect a chess algorithm that emphasized evaluation rather than calculation and brute force. His chess program, Pioneer, was a failure. In 1976, when Viktor Korchnoi defected, Botvinnik refused to sign any document condemning Korchnoi’s actions. In 1977, Botvinnik played his last public chess game in Montreal against Jean Hebert. Late in life, Botvinnik’s wife, Gayane, became mentally ill and had episodes so bad that she had to be hospitalized. On May 5, 1995, Botvinnik died at his home in Moscow of pancreatic cancer at the age of 83. Botvinnik played seven world championship chess matches. He finally lost the title at the age of 52. Botvinnik was the only man to win the world chess championship title three times. Botvinnik played every world chess champion of the 20th century. Botvinnik represented the USSR in 6 chess Olympiads, winning 6 gold medals for team play. In 1954, he won the gold medal for board 1 at the Amsterdam Olympiad. In 1958, he won the silver medal on board one. In 1960, he won the gold medal for board 2 (Tal played board 1). In 1964, he won the bronze medal on board 2 (Petrosian played board 1). His record from Olympiad play was 39 wins, 31 draws, and 3 losses for almost 75%. Botvinnik trained Anatoly Karpov, who became world champion, Garry Kasparov, who became world champion, Vladimir Kramnik, who became world champion, and Sergei Dolmatov, who became World Junior Chess Champion in 1978. His other students included Alexei Shirov, Vladimir Akopian, Jaan Ehlvest, Yusupov, Psakhis, Akhmylovskaya, Andrei Sokolov, Rozentalis, Nana Ioseliani. Botvinnik wrote 21 books on chess. 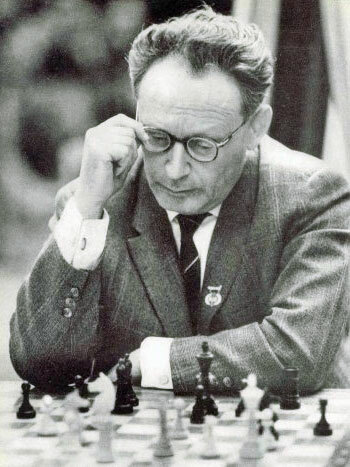 Botvinnik played in 11 USSR Championships from 1927 to 1955. Botvinnik had a plus score against Lasker (+1 =3 -0), Alekhine (+1 =2 -0), Smyslov (+26 =48 -21), Bronstein (+7 =16 -6), Spassky (+1 =6 -0), Keres (+8 =9 -3), Reshevsky (+5 =7 -2), Flohr (+5 =22 -2), and Boleslavsky (+6 =5 -0). Botvinnik had an even score against Capablanca (+1 =5 -1), Euwe (+2 =8 -2), Tal (+12 =20 -12), Korchnoi (+1 =2 -1), and Fischer (=1). Botvinnik had a minus score against Petrosian (+3 =18 -6), Geller (+1 =5 -4), and Fine (+0 =2 -1). On March 13, 2011, Botvinnik’s younger sister, Maria, died at the age of 90.